Governor Larry Hogan has signed an official proclamation designating November as “Hire A Veteran” Month in Maryland. The month-long observance raises awareness of veteran employment opportunities, and familiarizes citizens, business, and others with the many workforce services available to veteran jobseekers and employers. The proclamation was presented by Lt. Governor Boyd Rutherford at a special event at the Anne Arundel County Career Center in Linthicum Heights, Md. He was joined by Anne Arundel County Executive Steve Schuh, Veterans Affairs Secretary George Owings, Labor Secretary Kelly Schulz, Anne Arundel Workforce Development Corporation (AAWDC) President Kirkland Murray, and Cisco Security Business Group Vice President and Chief Architect Martin Roesch. Throughout November, Maryland agencies will increase employers’ awareness of the services and incentives available for hiring veterans, and veterans’ awareness of Maryland’s workforce development programs that can help them build and grow in their civilian careers. More than nine percent of Maryland’s adult population have served in the U.S. military. At today’s event, the AAWDC recognized partners in their Military Corps Career Connect (C3) program, which provides employment services for transitioning service members, active duty spouses, and recently separated veterans. Funded by a $4.3 million U.S. Department of Labor National Dislocated Worker Grant, C3 offers career planning, coaching, on-the-job training, work opportunity tax credits, and more to help jobseekers and employers. Further, Cisco announced the expansion of their successful CyberVetsUSA training program to eligible Maryland veterans, transitioning service members, military spouses, and members of the reserves and National Guard interested in pursuing a cybersecurity career. The self-paced, online courses in cybersecurity operations, software engineering, network security, and more are offered at no cost to program participants. 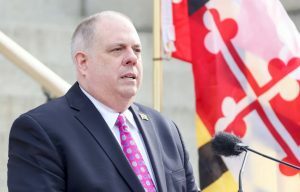 The Maryland launch of CyberVetsUSA will train at least 200 veterans who live and work in Maryland, a training and support commitment exceeding $750,000. To learn more about Maryland’s veteran-focused workforce development programs, visit http://www.dllr.state.md.us/employment/veteranservices.shtml. This entry was posted on November 6, 2018 at 6:53 am and is filed under All News, Anne Arundel News, Business, Calvert News, Charles News, Community, County, More News, Prince George's News, St. Mary's News, z 600X120 Top Ad Bottom, z 600X120 Top Ad Top. You can follow any responses to this entry through the RSS 2.0 feed.